Definition: Protection zone is defined as the part of the power system which is protected by a certain protective scheme. It is established around each power system equipment. When the fault occurs on any of the protection zones then only the circuit breakers within that zone will be opened. Thus, only the faulty element will be isolated without disturbing the rest of the system. The protection zone cover the entire power system, and no part of the equipment is left unprotected. It usually consists one or more element of the power system. The protection zone of the power system mainly depends upon the rating of the machine, its location, the probability of faults and abnormal condition of the equipment. If there were no overlapping in the protective zone, then the failure occurs in the equipment will not lie in any one of the zones and hence no circuit breaker would be tripped. The fault occurs in the unprotective system will damage the equipment and hence disturb the continuity of the supply. The figure below shows a certain amount of overlapping between the protective zones. The probability of failure in the overlap region is very small. 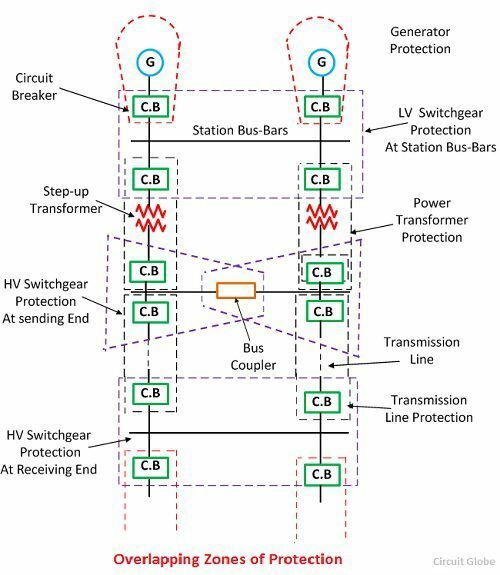 But the overlap region will cause the tripping of the more circuit breaker than the minimum necessary for the disconnection of the faults region. Because when the fault occurs in any one of the two overlapping regions than the breaker of both the region will be opened, and the systems are isolated. Consider the two protective zone A and B which will overlap each other. The X is the fault occurs in the zone B, and due to this fault, the circuit breakers of zone B tripped along with the C (circuit breaker). The relay of the zone B will also trip the circuit breaker of zone A for other faults in the zone B which occurs to the right of the C (circuit breaker). Hence the unnecessary tripping of the breaker can be tolerated only in the particular region. The scheme which senses the fault of any of the certain unit will have a high degree of sensitivity and it also has the adaptability of the fast speed of operation.